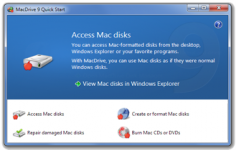 MacDrive Standard is a handy software utility that offers the possibility to open and save files on Mac disks directly. It allows to use all Mac media: floppy disks, hard drives, Zip, Jaz, SyQuest, ORB, LS-120, CD-ROM, etc. With MacDrive Standard installed on the Windows system, it is possible to access any Macintosh formatted disk directly from the desktop. It also allow to copy, open, save, delete and rename files on Mac disks at any time. 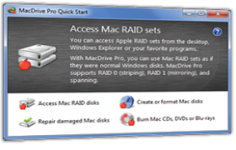 MacDrive Standard allows not only to import Mac files in Windows, but also provide Windows file to a Mac.